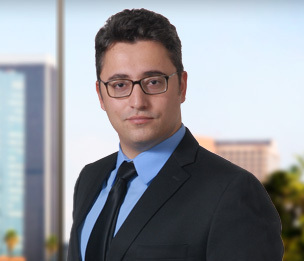 Dmitriy Kopelevich is an attorney in Dykema's Los Angeles, California office. Mr. Kopelevich is a member of the Automotive Product Liability Litigation Practice Group and manages a voluminous caseload of product liability claims and lawsuits, from inceptions to resolution, on behalf of manufacturers, distributors and designers of automobiles and other products. He has significant experience with automotive product liability cases involving airbags, seat belts, seats, structure, advance safety systems, vehicle data recording, data privacy, driver distraction, and “lack of” safety systems matters. He also serves as a member of the national discovery counsel team for a global automobile manufacturer. In addition to his automotive industry expertise, Mr. Kopelevich also maintains a substantial financial services litigation practice, including defending banks, mortgage servicers and other providers in negligence, breach of contract, quiet title, violation of California’s Unfair Competition Law (Cal. Bus. and Prof. Code §17200) and violation of the Homeowners Bill of Rights (Cal. Civ. Code §2923 et al.) cases, among others. Prior to joining Dykema, Mr. Kopelevich was an associate with a boutique law firm in Beverly Hills, California, where his practice focused on personal injury litigation and product liability cases. While in law school, Mr. Kopelevich was a legal extern in the litigation department at Sony Pictures Entertainment, Inc. He also previously served as Director of Technology for the Beverly Hills Bar Association. Mr. Kopelevich is fluent in Russian and is certified in Westlaw case law, statutory and secondary sources research.